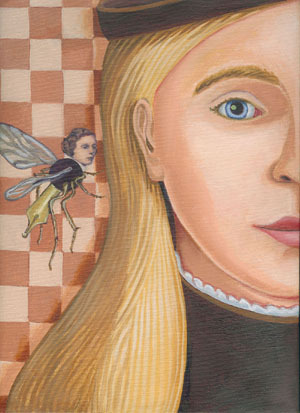 "A Puny Gnat Makes a Humorous Remark," oil on linen, © 2006, 12x9 in. The little voice sighed deeply. It was very unhappy, evidently, and Alice would have said something pitying to comfort it, 'If it would only sigh like other people!' she thought. But this was such a wonderfully small sigh, that she wouldn't have heard it at all, if it hadn't come quite close to her ear. The consequence of this was that it tickled her ear very much, and quite took off her thoughts from the unhappiness of the poor little creature. 'I know you are a friend,' the little voice went on; 'a dear friend, and an old friend. And you wo'n't hurt me, though I am an insect.'" --from "Through the Looking-Glass," by Lewis Carroll.